A kale salad was in order, of course. Some creamy avocado, some toasted almonds for crunch. I gave that fermented black garlic one last chance and blended it into a vinaigrette. Last time I baked it and I thought maybe I had destroyed its magic properties with the heat–but no, its flavor simply isn’t that dramatic. So you can save yourself $3.50 and substitute half a head of roasted garlic for the black garlic if you prefer. 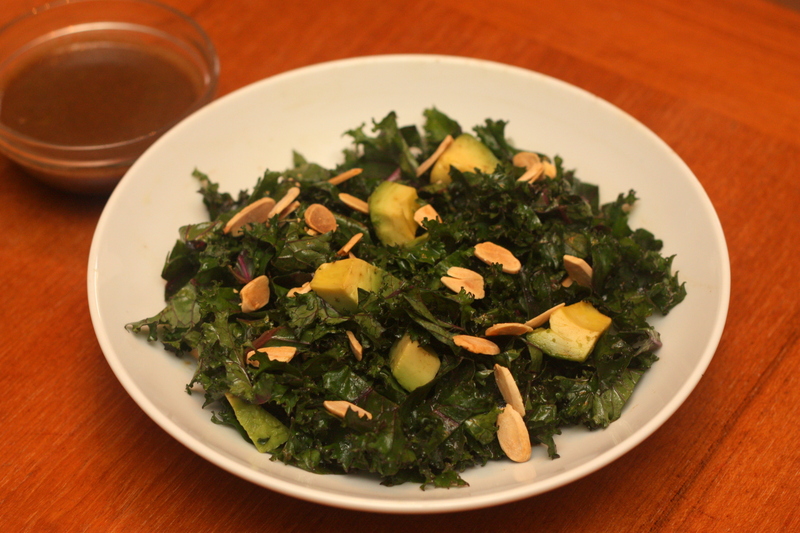 Kale and Avocado Salad with Black Garlic Vinaigrette: First, make your dressing by blending the following until smooth: 1/2 head black garlic (or substitute 1/2 head roasted garlic or 1 regular garlic clove), 2 Tb. rice vinegar, 2 Tb. olive oil, 1 Tb. chopped parsley, and salt and pepper. Tear a bunch of kale into bite-sized pieces. Dress and toss well, then divide between bowls. Top each bowl with some diced avocado and a handful of crunchy toasted sliced almonds. And that recipe – exactly what I’ll cook up today with the avocados sitting on the shelf and the beautiful bunch of kale from my friend’s farm down the road! However, no ‘black garlic’, so I shall roast some plain garlic instead. I am so making this salad today! I can’t resist the combination of kale and avocado, and your dressing sounds terrific. I lived in LA for grad school with my best friend, too, and that’s also what I loved most. We had all our favorite breakfast spots and cute shops on Montana to pop into together…so much fun. You are fortunate to have your close friend here in Seattle now and that you can continue to share together. Sweet story. Isn’t it funny how things work out like that? Sometimes it happens that the people you’re closest to end up where you are. It actually seems like everyone is moving to Seattle these days. My best friend is up there, and Susan from Susan Eats London is moving there from London. Maybe it’s a sign! Your kale and avocado salad looks good! It’s kind of sad that the black garlic wasn’t more dramatic of a flavor. I mean, if something is called fermented black garlic, is it wrong for me to expect something strong?